Leonard Benjamin Franklin was born into a Jewish family in 1862 in London. He was educated at King’s College School in London and at Athénée Royale in Brussels. He went on to study law and was called to the Bar at the Inner Temple in 1894. However, he never practised law but instead joined his father’s bank, A Keyser & Company, independent merchant bankers, in 1892. In 1929 Leonard was appointed as a senior partner in the company. His work took him all over the world to places such as: the Canary Islands, Gibraltar, Morocco, Argentina, France and the West Indies. Outside of his work, Leonard was very active in social work with the Jewish Community in London and held respected positions in many synagogues. He was a vice-president of the Jewish Workingmen’s Club and of the South Hackney Jewish Social and Literary Society. 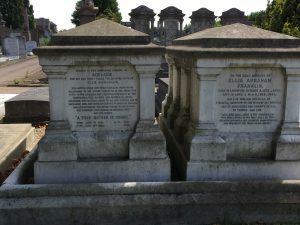 He was on the Board of the Hackney Synagogue and was Treasurer of the Burial Board of the United Synagogue. He had also helped finance the building of the new Southend and Westcliff Synagogue, which he opened in 1912. During World War 1, Leonard was appointed as Local Government Representative at Folkestone and tasked with dealing with the influx of refugees from Belgium, when the voluntary War Refugee Committee could no longer cope with the number of refugees arriving. Later he was posted to France to report on the finances of British Military Hospitals. In 1919 he was awarded the OBE for his work. Leonard was an active member of the Liberal Party and stood for election several times in various London seats from 1910. Finally, in the general election of December 1923 he became MP for Hackney Central. But, at the October 1924 general election he lost his seat when the Conservatives regained control. He was made a Knight Bachelor in the King’s Birthday Honours List of 1932 for his political and public services. In January 1888 Leonard had married Laura Agnes Ladenberg at the New West End Synagogue in Bayswater. They had four children: three daughters, Jeanette, Ruth and Adelaide, and one son, Adrian. Leonard and Laura started their married life in London but Leonard subsequently acquired The Grange in Goudhurst when Mrs Adele Newington sold it in 1901. After substantial rebuilding works, The Grange became his family home but he also retained a house in London for his work. In 1907 he became a Justice of the Peace for the Cranbrook Division, which included Goudhurst. The only memorial to the Franklin family in Goudhurst is the water fountain & horse trough which he had erected on The Plain. Before the advent of the motor car the only means of transport through Goudhurst was either on foot or by horse, and the steep hill leading into the village meant that pedestrians and horses alike arrived at The Plain both tired and thirsty. 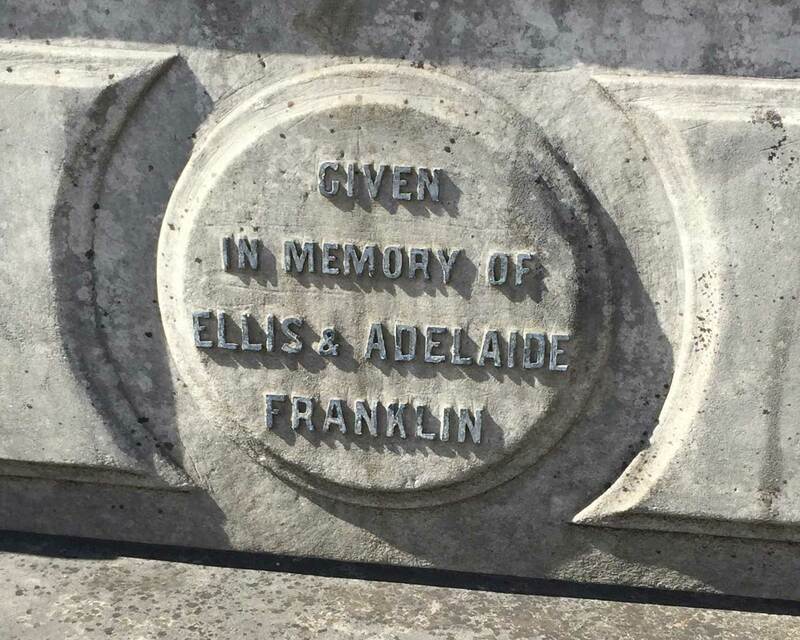 The offer by Leonard Franklin of a fountain near the pond in memory of his late parents, Ellis and Adelaide Franklin, was therefore enthusiastically welcomed by the Parish Council of the time. Neither of his parents lived in Goudhurst and although his mother died in 1902, it was after his father’s death in May 1909, perhaps feeling that he was well enough established in the village, that Franklin made his offer. 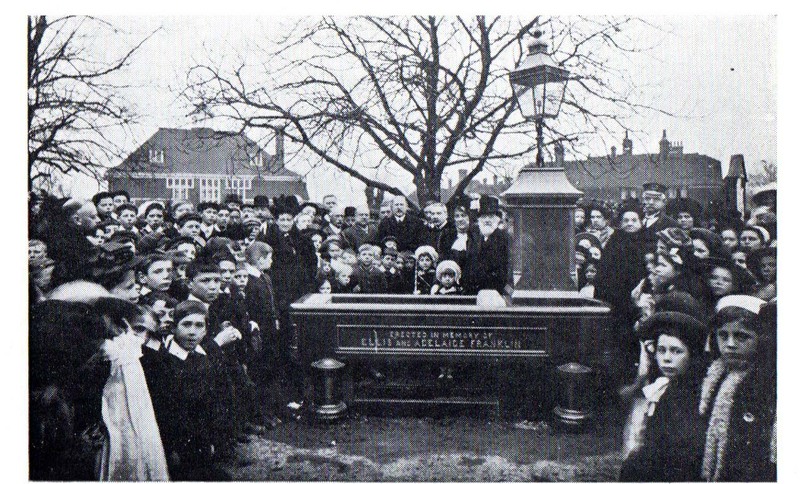 The cattle trough and drinking fountain (as it was referred to by the newspapers of the day) was completed in October 1910 and Franklin received a “hearty vote of thanks” from the Parish Council. The photograph of the opening ceremony shows a large crowd of both adults and children gathered to celebrate the event, although the only identifiable figure is the elderly gentleman (Rev. 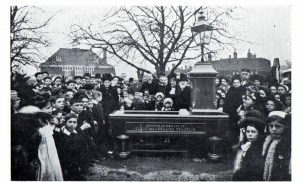 James S Clarke, vicar of St Mary’s) with the beard and top hat standing immediately to the left of fountain. Since then, or at least until the advent of motorised transport, it was well used by thirsty horses, including those of the troops who passed through the village during the Great War. By 1935, however, Alfred Tiffin in his Goudhurst Jubilee Book was already lamenting that the travellers of his day were failing to appreciate it. Nowadays, the trough is planted with flowers and the drinking fountain is no longer in use. Sir Leonard Benjamin Franklin OBE JP died at home on 11 December 1944 aged 82 years. His wife, Laura, continued to live at The Grange and survived him by 8 years, dying on 20 February 1952 aged 85 years. Like his parents, both Leonard and his wife are buried in Willesden Jewish Cemetery.